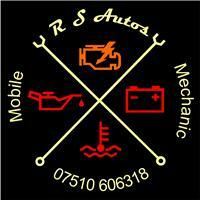 RS Autos - Garage/Vehicle Services based in Hounslow, Middlesex. My name is Stuart Lucas I have been trading as RS Autos for 3 years after successfully running several garages over the last 20 years, I decided to go out on my own as I am a qualified mechanic and Mot tester with over 25 years’ experience all work is carried out on a personal basis by either myself or my son. We offer Servicing, Mots and general repairs at competitive prices.